A simple yet delicious snacks for kids or grown ups. Specially kids because kids love hotdogs. 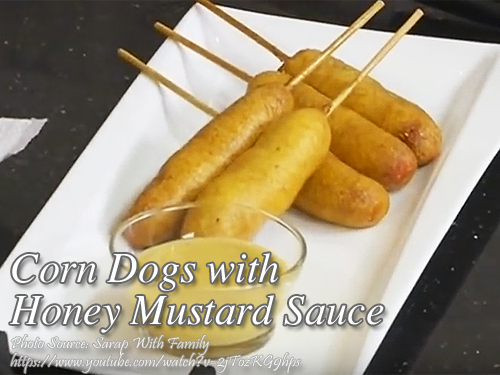 This simple procedure for making corndogs can be cooked in a matter of minutes because all you have to do is to make a batter and coat the hot dogs and deep fry it until golden brown. Actually it is similar to waffle hotdogs and you can also make hotdogs on a stick using pancake batter. But the only difference with corn dogs with waffle hotdogs is the cornmeal added to the batter mixture. Cornmeal is made from dried corn ground into fine, course or medium consistencies. It makes the corndog batter coating a crispier texture compared to only using wheat flour. This ingredient is not always available in supermarkets but you can order online on some local online shopping stores. Or you can substitute it with crushed cornflakes. Just use unsweetened or plain cornflakes and use a blender to grind the cornflakes to make a fine consistency. Prepare the hotdogs first by cutting shallow slits on the sides. Skewer each with bamboo sticks and coat with flour. Set aside. In a bowl, put the flour, cornmeal, sugar, baking powder, egg and milk. Mix all the ingredients using a whisk until it turns in to a smooth batter and all the lumps are gone. Heat cooking oil in a deep pan deep enough to deep fry the corn dogs. To coat the hotdogs with batter easier, get a tall glass and pour the batter into it. Dip each hotdogs in the glass until the batter is well coated. Fry the corn dogs until golden brown and crispy. Remove from the pan and transfer to a paper towel to remove excess oil. Make the dipping sauce by combining honey, mustard and mayonnaise in a small bowl. Mix until it smooth. Serve with the corndogs as dipping sauce.